The Designer 1 features 54 to stitches on the Quilt Menu, and 16 stitches on the Applique Menu. There are 15 different styles of buttonholes and three alphabets with upper and lower case letters and numbers. There are also children’s stitches, heirloom stitches, and several different kinds of decorative stitches. The Designer I’s color screen is your control center and the organization of the stitches into menus made it easy to remember the location of the most used stitches. 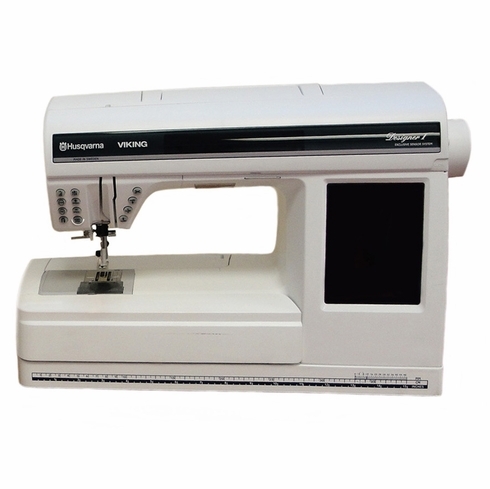 The Designer I is an easy-to-use sewing machine for free-motion quilting and machine applique. Machine quilting is so smooth and effortless, all your work will look fabulous! The Designer I also includes a mock hand-quilting stitch and it's quite simply the best choice for all your sewing, quilting and embroidery projects. Note: This pre-owned, used machine has been cleaned, serviced, is ready to GO and may be repackaged in a generic brown box. Disclaimer: Only accessories pictured in the product images are included.